Today's Sensational Shop is - Nightengale Needles run by Emily Smith! Sewing runs in the family. Mom made all our Halloween costumes, and before that, worked on Broadway for many years as a wardrobe mistress. When I started Nightengale Needles it was a response to my frustrations with normal 9-5 or retail jobs. I tried both types, but the fit just wasn't right. Sewing for a living is a ton of work, but much more my speed. I'm pretty type-A, a bit of a perfectionist, and for the life of me I can't remember to sleep on a regular schedule, or feed myself regularly. Love my cat. Pretty typical "artist quirks." I'm really vain about my hair - it's blue. And I collect really improbable high heels. 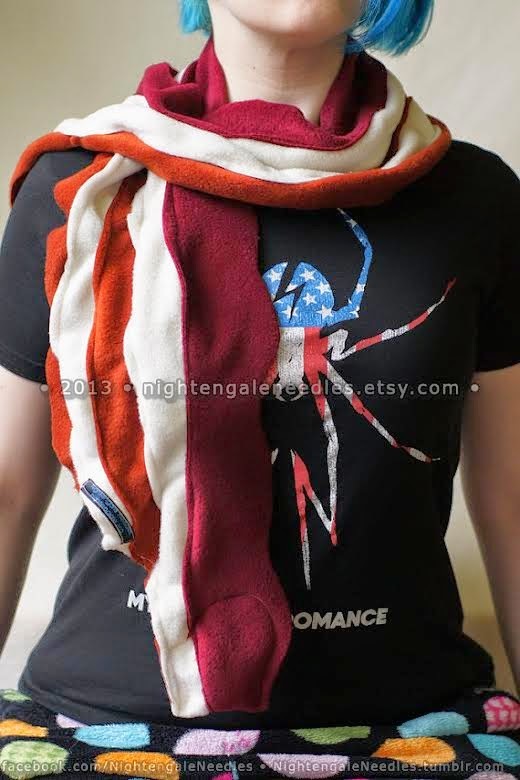 Nightengale Needles is fannishness and geekery by way of fabric. 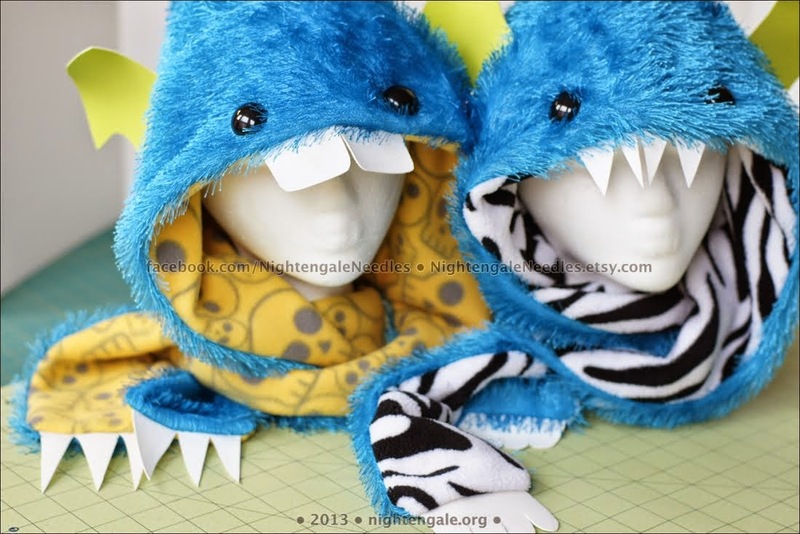 For most of my mass-produced items I use fleece, minky, plushfleece, cuddlefleece, fur, and other cuddly stuff to make hats, hoods, scarves, and plush. Lots and lots of plush. I take inspiration from popular media but also just from the types of things that I like: bright, colorful, fun, odd things, things that look both friendly and toothy. Well, my most popular item is my Squeaky Bacon Scarf, and I love making those just because they get such a good reaction at my shows. "Is that bacon?" "Yup, and it SQUEAKS." I never get tired of the "Wow!" reaction on peoples' faces. For me, though, my favorite items are my Monster Scoodies. I can use all sorts of wild colors and patterns, and the crazier I make them, the more popular they seem to get. I'm a big fan of highly saturated colors and bold contrasts, and the Monsters are the perfect excuse to limitlessly play with that. I started in 2008, though I didn't know it at the time. I'd taken commissions, one-off orders for corsets, in 2006 & 2007. I had fun with them, but the incredibly skilled, glutted marketplace that I was up against made me really think hard about the saleability of my efforts. I was young too, so I didn't have the resources for materials that were required to compete with the many talented corsetiers selling on Livejournal corset communities at that time! I wanted to keep sewing for sale, but wasn't sure how to go about it. In 2008, a fundraiser was started for defeating a piece of legislation in California. 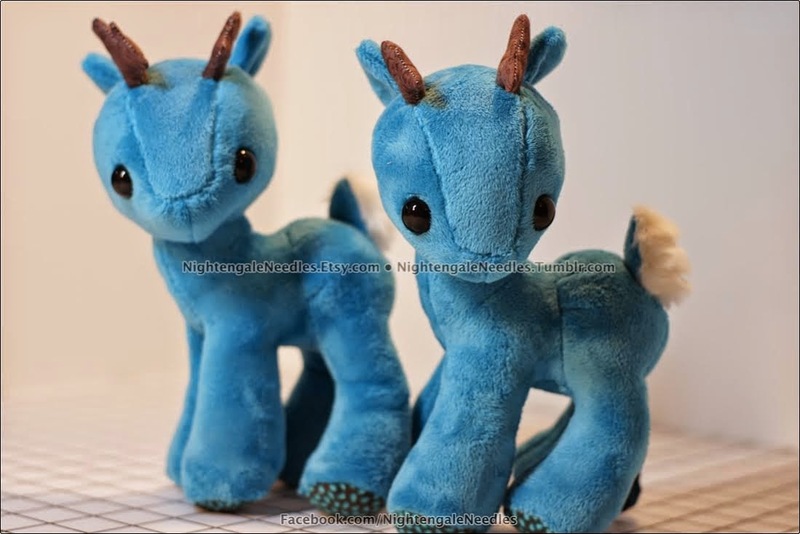 I signed on, and offered donations of custom plush toys. I originally intended to offer 3; the total number of orders came out to 13. From there, I decided maybe I had something going, so I opened an Etsy shop. I knew nothing about promotion on the web, and Etsy was tiny and new at that time, so my shop mainly sat idle until 2009, when I began selling at fairs, conventions, and other offline venues. From there, I've just been trying to keep up! I want to get back to garment construction & costuming. I miss it! Until I get back to it, I've been keeping my tailor's eye fit by blogging about clothing fit, sewing for the body, elements of garment design, structure, and construction, color theory, and spatial balance in outfits, over on my Tumblr, nightengaleneedles.tumblr.com. Thank you so much for stopping by to meet Emily Smith of Nightengale Needles! I'll see you next week for another Sensational Shop Saturday!